By now we’ve realised that the Kimberley does nothing by halves. It’s impossible to not be impressed by the size of everything, including how big some of the corrugations can be. Leaving Purnululu we could not help but feel that may have been the highlight of our trip, back along that rough track, which seemed longer and rougher on the way out, as they always seem to. We again gawked at the amazing Osmand Ranges before heading north towards Kununurra. If you’ve ever seen any movie of the American Mid-West, this stretch of highway is exactly like that. Nothing could have prepared us as we drove through first the Pitt Range, then the O’Donnell Range, then Ragged Range, the Carr Boyd Range, the Saw Range and finally the Deception Range, Each as spectacular as the last (Mr. loves his facts, must be the engineer in him). We grabbed lunch at The Hoochery, we taste tested some of their award winning rums and liqueurs and shared an amazing burger and barramundi, we can thoroughly recommend dropping in for a feed. This place would be pumping in high season with an old piano out the back shed with two huge barbeques and a bar. 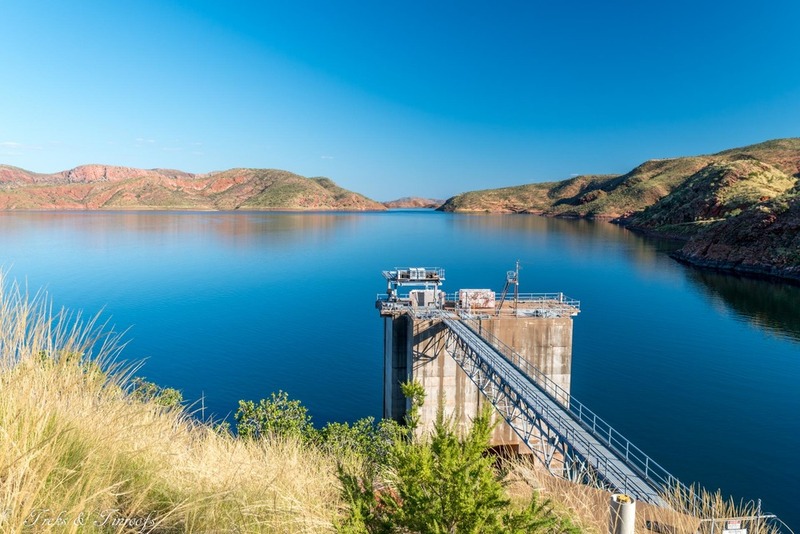 We then head to our planned recovery stop at Lake Argyle. 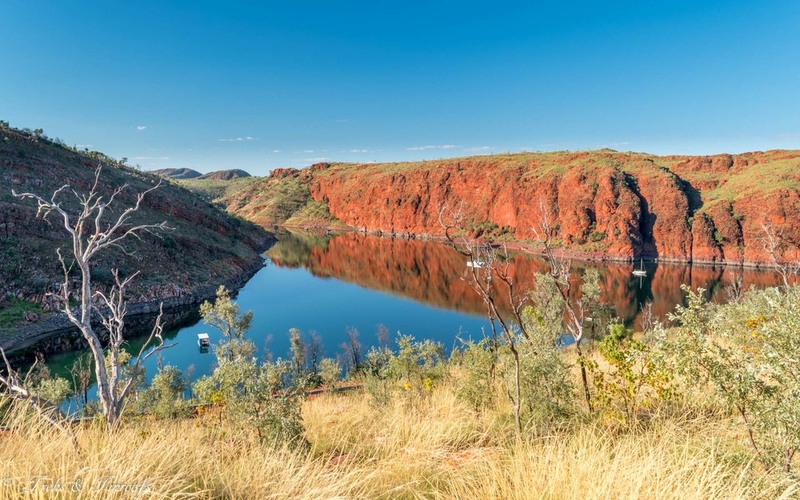 Lake Argyle Caravan Park was voted the best Caravan Park in Australia last year (10 years ago it was the worst!). We do have to say though they do squish you in like sardines, even the people staying in caravans said the same thing. The attraction of this place sure isn't the campsites and would have to be our least favourite from the trek so far. It has to be the draw card of the pool as views like this... can you complain. The large bay the pool overlooks is in fact only 1% of the entire Lake Argyle, Australia’s largest manmade lake and current capacity at 17 times Sydney Harbour you can’t help but be impressed. You can also grab one of their well-regarded steaks, or as we experienced, fantastic salt and pepper squid while sipping a cold Matsos Ginger Beer from the outdoor bar. On the weekends they get the footy on the TV and three nights a week they have live music. 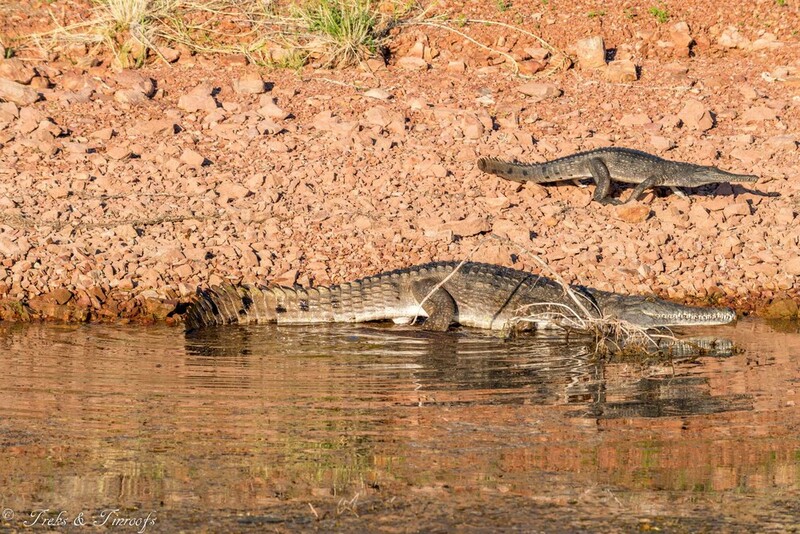 Everyone told us, if you go to Lake Argyle you must do the sunset cruise. Once again we were not disappointed with the quality and amazing history of this place. I won’t give away all the facts but two that really stick in my mind are, the amount of water that leaves the lake in two days from evaporation and through the dam’s power turbines is equivalent to the entirety of Australia’s water usage for 15 months and secondly if the dam wall were to be removed it would take 4 years to drain, something similar to a pin prick in an Olympic swimming pool. 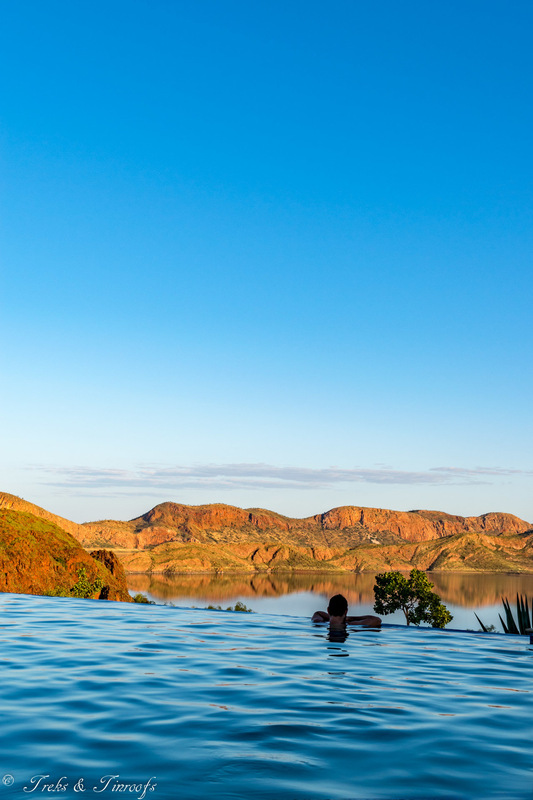 There can hardly be a better way to finish another hot Kimberley day than swimming in Lake Argyle, drinking a cold beer and eating nibbles while watching the sunset over the Carr Boyd Range. If there is a regret, it would be that we didn’t get in a helicopter to see this place from above. But after two days relaxing around the pool and enjoying proper toilets and showers we’re eager to start the next leg of our journey, the famed Gibb River Road, which is where the idea for this whole Trek all began a couple of years ago.